Speed limits are important to limit the number of car crashes on Washington roads. Obeying the speed limit not only will help you to avoid a traffic ticket but will also keep you safe from a car accident. In Washington, the speed limit is, in fact, the LIMIT, meaning a driver may not exceed the posted speed limit. In general, the speed limit in city and town streets is 25 MPH, 50MPH on county roads, and 60MPH on state highways. Local authorities and the Department of Transportation may assign lower or higher speed limits to roadways, but no speed limit can be greater than 75MPH on highways, and 60mph in cities and towns. As always, in dangerous road conditions, be sure to slow down. Washington law allows authorities to stop drivers for any speed greater than is reasonable and safe given the conditions, even if you are under the posted speed limit. The following is the Washington Rules of the Road regarding speed limits. RCW 46.61.400: Basic rule and maximum limits. No person shall drive a vehicle on a highway at a speed greater than is reasonable and prudent under the conditions and having regard to the actual and potential hazards then existing. In every event speed shall be so controlled as may be necessary to avoid colliding with any person, vehicle or other conveyance on or entering the highway in compliance with legal requirements and the duty of all persons to use due care. Except when a special hazard exists that requires lower speed for compliance with subsection (1) of this section, the limits specified in this section or established as hereinafter authorized shall be maximum lawful speeds, and no person shall drive a vehicle on a highway at a speed in excess of such maximum limits. Sixty miles per hour on state highways. The maximum speed limits set forth in this section may be altered as authorized in RCW 61.405, 46.61.410, and 46.61.415. The driver of every vehicle shall, consistent with the requirements of subsection (1) of this section, drive at an appropriate reduced speed when approaching and crossing an intersection or railway grade crossing, when approaching and going around a curve, when approaching a hill crest, when traveling upon any narrow or winding roadway, and when special hazard exists with respect to pedestrians or other traffic or by reason of weather or highway conditions. RCW 46.61.410: Increases by secretary of transportation—Maximum speed limit for trucks—Auto stages—Signs and notices. (1)(a) Subject to subsection (2) of this section the secretary may increase the maximum speed limit on any highway or portion thereof to not more than seventy-five miles per hour in accordance with the design speed thereof (taking into account all safety elements included therein), or whenever the secretary determines upon the basis of an engineering and traffic investigation that such greater speed is reasonable and safe under the circumstances existing on such part of the highway. (b) The greater maximum limit established under (a) of this subsection shall be effective when appropriate signs giving notice thereof are erected, or if a maximum limit is established for auto stages which is lower than the limit for automobiles, the auto stage speed limit shall become effective thirty days after written notice thereof is mailed in the manner provided in subsection (4) of this section. (c) Such maximum speed limit may be declared to be effective at all times or at such times as are indicated upon said signs or in the case of auto stages, as indicated in said written notice; and differing limits may be established for different times of day, different types of vehicles, varying weather conditions, and other factors bearing on safe speeds, which shall be effective when posted upon appropriate fixed or variable signs or if a maximum limit is established for auto stages which is lower than the limit for automobiles, the auto stage speed limit shall become effective thirty days after written notice thereof is mailed in the manner provided in subsection (4) of this section. (2) The maximum speed limit for vehicles over ten thousand pounds gross weight and vehicles in combination except auto stages shall not exceed sixty miles per hour and may be established at a lower limit by the secretary as provided in RCW 46.61.405. (3) The word “trucks” used by the department on signs giving notice of maximum speed limits means vehicles over ten thousand pounds gross weight and all vehicles in combination except auto stages. (4) Whenever the secretary establishes maximum speed limits for auto stages lower than the maximum limits for automobiles, the secretary shall cause to be mailed notice thereof to each auto transportation company holding a certificate of public convenience and necessity issued by the Washington utilities and transportation commission. The notice shall be mailed to the chief place of business within the state of Washington of each auto transportation company or if none then its chief place of business without the state of Washington. RCW 46.61.415: When local authorities may establish or alter maximum limits. (c) Decreases the limit but not to less than twenty miles per hour. (2) Local authorities in their respective jurisdictions shall determine by an engineering and traffic investigation the proper maximum speed for all arterial streets and shall declare a reasonable and safe maximum limit thereon which may be greater or less than the maximum speed permitted under RCW 46.61.400(2) but shall not exceed sixty miles per hour. (3)(a) Cities and towns in their respective jurisdictions may establish a maximum speed limit of twenty miles per hour on a nonarterial highway, or part of a nonarterial highway, that is within a residence district or business district. (b) A speed limit established under this subsection by a city or town does not need to be determined on the basis of an engineering and traffic investigation if the city or town has developed procedures regarding establishing a maximum speed limit under this subsection. Any speed limit established under this subsection may be canceled within one year of its establishment, and the previous speed limit reestablished, without an engineering and traffic investigation. This subsection does not otherwise affect the requirement that cities and towns conduct an engineering and traffic investigation to determine whether to increase speed limits. (c) When establishing speed limits under this subsection, cities and towns shall consult the manual on uniform traffic control devices as adopted by the Washington state department of transportation. (4) The secretary of transportation is authorized to establish speed limits on county roads and city and town streets as shall be necessary to conform with any federal requirements which are a prescribed condition for the allocation of federal funds to the state. (5) Any altered limit established as hereinbefore authorized shall be effective when appropriate signs giving notice thereof are erected. Such maximum speed limit may be declared to be effective at all times or at such times as are indicated upon such signs; and differing limits may be established for different times of day, different types of vehicles, varying weather conditions, and other factors bearing on safe speeds, which shall be effective when posted upon appropriate fixed or variable signs. (6) Any alteration of maximum limits on state highways within incorporated cities or towns by local authorities shall not be effective until such alteration has been approved by the secretary of transportation. RCW 46.61.419: Private roads—Speed enforcement. (4) Signs have been posted declaring the speed limit at all vehicle entrances to the community. 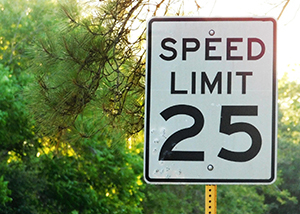 Excess speed is a common cause of auto accidents. If you are injured in a car accident, contact an experienced and knowledgeable personal injury attorney at Parke Gordon Law Firm in Spokane to represent you. Our law firm believes every client deserves fair representation against big insurance companies with deep pockets. Call our Spokane law office today at (509) 482-7274 today for a free consultation to discuss your car accident case for free with an attorney.